In April 2014, the Centre and the rest of VIDRL moved into the newly established Peter Doherty Institute for Infection and Immunity. 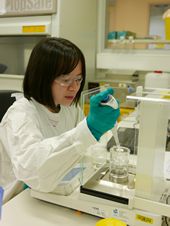 The Doherty Institute is a joint venture between the Royal Melbourne Hospital and The University of Melbourne which brings together over 700 scientists, researchers, academics, clinicians and graduate students working in infectious disease and immunity. The Institute combines biomedical and clinical research, undergraduate and postgraduate teaching, epidemiology, and diagnostic and reference laboratories. We are excited to have moved into our new facilities, which will provide access to a wider range of resources and new collaborative opportunities with other research, public health and clinical groups in the Institute. Directions to the Doherty Institute can be found here.